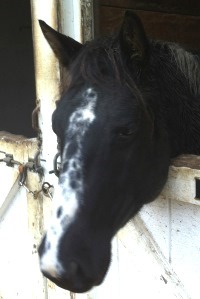 “Rosie” is a paint pony who was rescued from the streets of Philadelphia by Last Chance Ranch. Despite her harsh start in life, she’s sweet and outgoing, and loves attention. She’s still adjusting to her new life, perfecting her ability to stand for the farrier and hold her feet up while he trims them. Still, Rosie is regularly handled by young children, and she’s learning to be ridden at a walk, trot, and canter. We’re excited to see her flourish!